This has been a big week for owls in St. Anthony Park – our neighborhood in St. Paul. Today I saw two more. 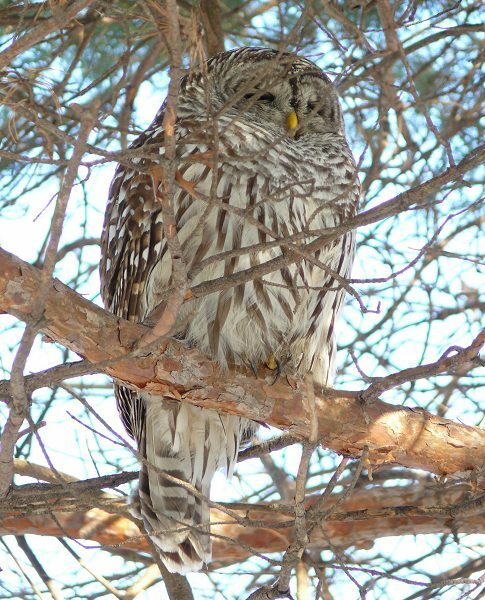 A friend wrote me yesterday saying that they had been seeing a Barred Owl in a tree in their yard. 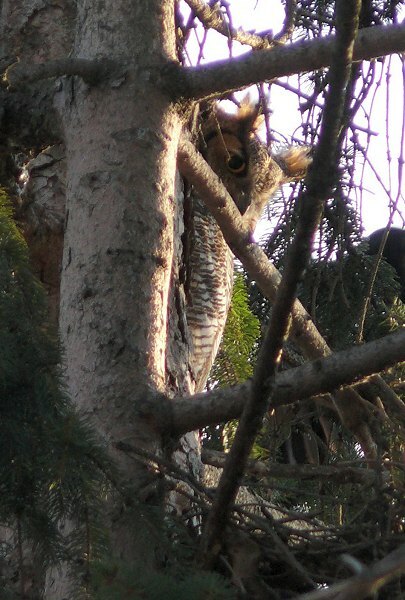 When I stopped by today, the owl was there – about 10 feet up in a tree, a few feet from their back door. On the way home I stopped to investigate a loud flock of crows, and I found that they were mobbing a Great Horned Owl. The owl was hiding in the thick branches of a spruce tree. The crows were getting very close to its hiding place – nearly touching it at times. The dark shape to the right of the owl in the photo is a crow.